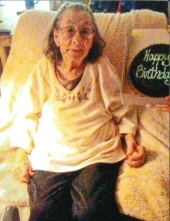 Catherine Lewis Verhine of Bremen passed away Friday, January 18, 2019 in a local hospital. She was born in Cartersville, May 23, 1930, daughter of the late Thad Lewis and Tinnie Height Lewis. She was a member of the Crossroads Baptist Church. In addition to her parents, she was preceded in death by her husband, Henry Grady Verhine; a daughter, Barbara Goodner and a son, Charles Verhine. Survivors include her children, Clyde Verhine, Virginia Frady and Amelia Fleshman; fourteen grandchildren; fourteen great grandchildren and seven great, great grandchildren; two sisters, Caroline Dockery, Claudie Mae Garrett and two brothers, Charles Lewis and Clifford Lewis. The family will receive friends at the funeral home Monday from 12:00 until 2:00 PM. Services will be Monday, January 21 at 2:00 PM from the chapel of Hightower Funeral Home with Reverend Buddy Gentry officiating. To plant a tree in memory of Catherine Lewis Verhine, please visit our Tribute Store. "Email Address" would like to share the life celebration of Catherine Lewis Verhine. Click on the "link" to go to share a favorite memory or leave a condolence message for the family.